Now if you are here from Ann then you're in the right place, if not then you may want to start in the beginning. If you get lost I have the entire line up below this post. Here is what I made! LOVE Maleficent! I stamped my sentiment from V is for Villains on a Flag Dies.. Here is a close up of Maleficent which is a free file! 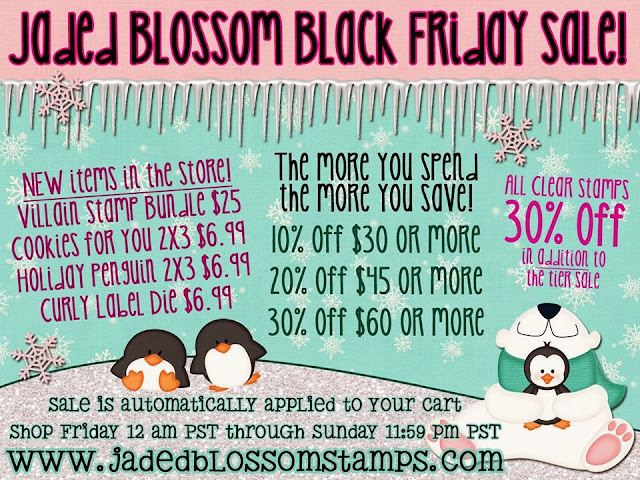 But before you go here are some information on Jaded Blossom and SVG Cutting Files Black Friday Sales. 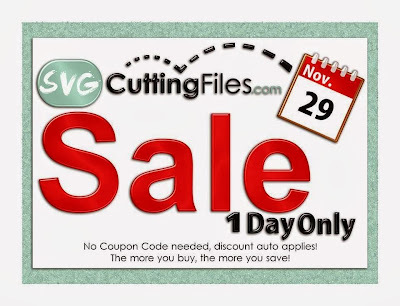 Annie - SVG Cutting Files Crystal Jamie Kate Barb Gigi Gwen Jenny Trixie Mel Candace Z. Jeanne Jaymie Annie Candace P.
Thank you all so much for joining us and we hope your all having an Awesome Holiday Weekend with your Families! cute cute and more cute..this blog hop has been awesome. The best villain and the color coordination on this project is spot on. Oh my gosh! Just when I thought my brain had been overloaded with the awesomeness of this blog hop I get to you and my brain short circuited! 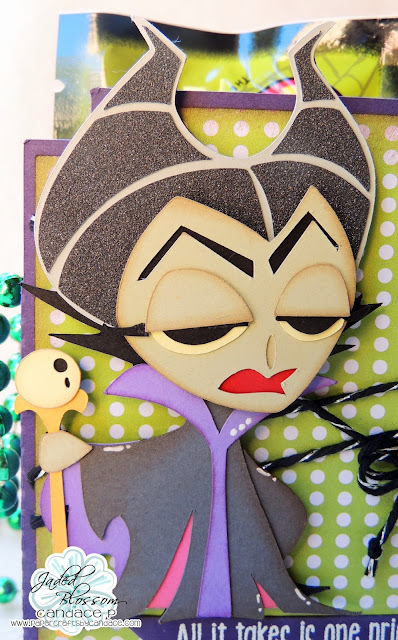 This project of Malificent is fanFreakinTastic! I love the shading, her horns and eyes!!! Her expression is the best! That sentiment is just too funny. I love this project. These are Great! Thanks for the fun this morning! Awesome hop and loved all the creations! This project is soooo great and I love the sentiment!! Looks great. Love the stamp goes perfectly with her. What an amazing finish to the hop! Loved all the villains. This one is terrific. Love the sentiment. I love Maleficent! Great job on creating her! I think each of you ladies did a wonderful job creating your projects! I love them all and can't wait to receive my files so I can get crafting! Oh, she was wicked-ly cute!! Wonderful project! Love them all! This blog hop was way more fun than out battling the stores....Thank you and all the gals for all your hard work. Love this project -- thanks for sharing. She looks so deliciously evil. Great job! Love Maleficent!!! I already ordered this set since it is a MUST have!! Great project and thanks for more inspiration!!! Love the project great job. Love it I cant wait for the movie to come out. Thank you for sharing. This is fantastic! I love her! Perfect sentiment to go with a perfect project. I am so so so happy that you did Maleficent I have to agree she is my most favorite villain! She is fabulously wicked!! Maleficent is scary. You did a fantastic job. This is great!!! Thank you so very much!!! Happy Holidays!!!! this is great! can't wait to see this movie next summer! great job! I was so hoping for a Maleficent! Saved the best for last! Great job!! AWESOME~ She is perfect and those treats are just too good for this project! How cute!! she is brilliant! great work. very cute! Great job! She turned out awesome! I am blown away by your project. She is gorgeous. I love her lazy eyes! The best blog hop ever, finished with a great Malafide. Thank you! What a way to end this amazing hop! I just LOVE LOVE LOVE your project and the new stamps are so awesome!!! Super fun projects by everyone and the new files are amazing as well!!! I love the sentiment it's perfect for your wonderful witch! HaHa! I love it! I love the saying to go with it! Just perfect! Love the hop, the projects, the villains. Excellent job! Maleficent is the scariest of them all. I love this project, the colors are just right and the JB sentiment is perfect for her. I LOVE Maleficent! Your project is awesome! Thank you for sharing I am now a follower. WoW!!!! This has been a wonderful Hop!!!! Simply amazing!! Great treat box!!! Thanks for the hop. Maleficent sure looks mad. I love this design. Happy thanksgiving to you all! I love that sentiment! Your Malificent looks amazing! I love how you did her hair! Fantastic! Details are amazing! Loved the hop and the stamp sets are to die for! You did such a great job. Thanks for sharing. I just love it. Ain't that the truth...love this saying. Awesome stamps and blog hop! She is great! Love the details! She is awesome! Love the stamp too! this hop was awesome !!! perfect project candace!!!! My all-time, absolute favorite, Maleficent! Awesome project! My favorite movie as a kid - always have loved Maleficent!!! She turned out great!! Love it Candace!!!! Fabulous project as always!!! The saying is perfect for this!! You can just see her saying that! I could totally see this on a "I hate Mondays card" Very cute. You saved the best for last. Well done. Her face is divine! This was a super fun hop... everyone did such a great job! So much awesome detail!!! She looks great!! Love your project!!!! I can't wait to try this one! Love the details and the colors. Your Maleficent is fantastic!! I can't wait to see Angelina Jolie as her next year. what a great project!!! Love this! This is so cute! This was such a fun hop and your project is so cute. I follow you with bloglovin' and Google friend connect. Great project and I just love that stamp!!! This one is awfully cute! 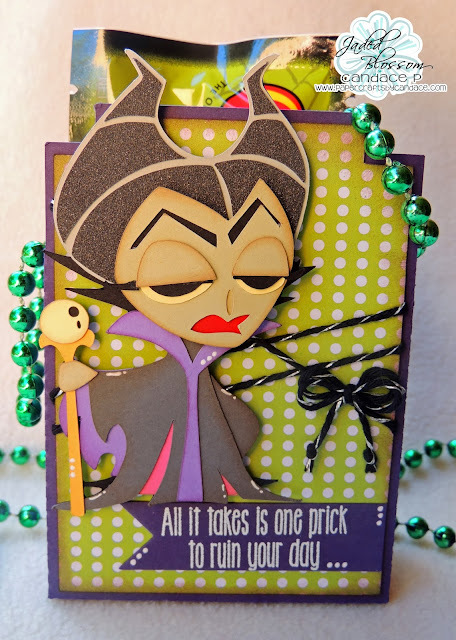 LOVE Maleficent, she's one of my favorites! Speechless...ladies...all of you... those projects are so beautiful. I hope you all can read me. I have problems on showing and matching colors if they are not in a collection. Thank you . Great Project and great hop today. Thanks to everyone for the projects. wonderfully detailed file, love how you did the hair. YOu are so gifted, It's so cute, thank a lot! Wow! Those SVG files of Annie's & your stamps are AMAZING!!! :) You and the designers did such a great job on all of the creations, too! Love this project! They were all fantastic! I think this is my favorite project! <3 your villain! she is great since she will be having her own movie out soon!! Adore these images and sentiments - wonderful job - TFS! She is just brilliant! What a great line of villians, this has been such fun!! No, she's my favorite! How can I choose between them all?? Love them all and the creative women behind them! Adorable...love that sentiment. I always loved Malificent...I thought the horns were cool! This one is my favorite love love love it!!! wow....this is so cool! I love the details and the cool jelly beans! that worked out perfectly! Super cute. Love your treat box and all the details on her. Thanks for sharing!! Love it! 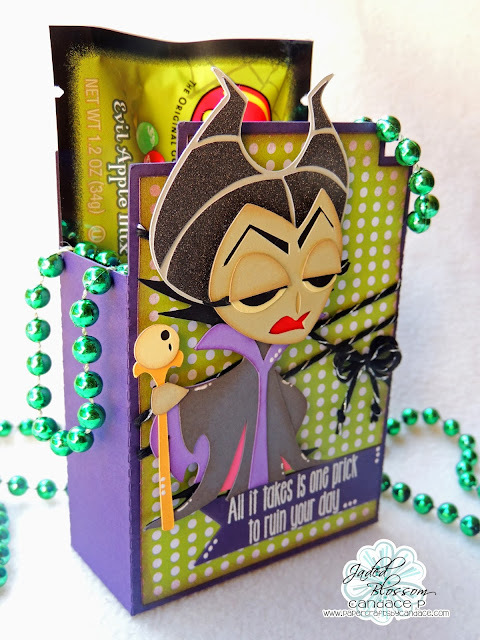 The tombstone treat box is perfect for Maleficent, and that is such a great sentiment! Thanks for sharing!!! this has been an amazing hop you guys all did great projects the stamps are so amazingly perfect. CANDACE!!! I LOVE how you did this!!!! And the stamp is SOOOO perfect for how evil you made her!! Great job!! This has been amazing! Thanks! Oh love love her! you did a great job! ... I dressed up like her one Halloween. Abby's Mom made me the costume! 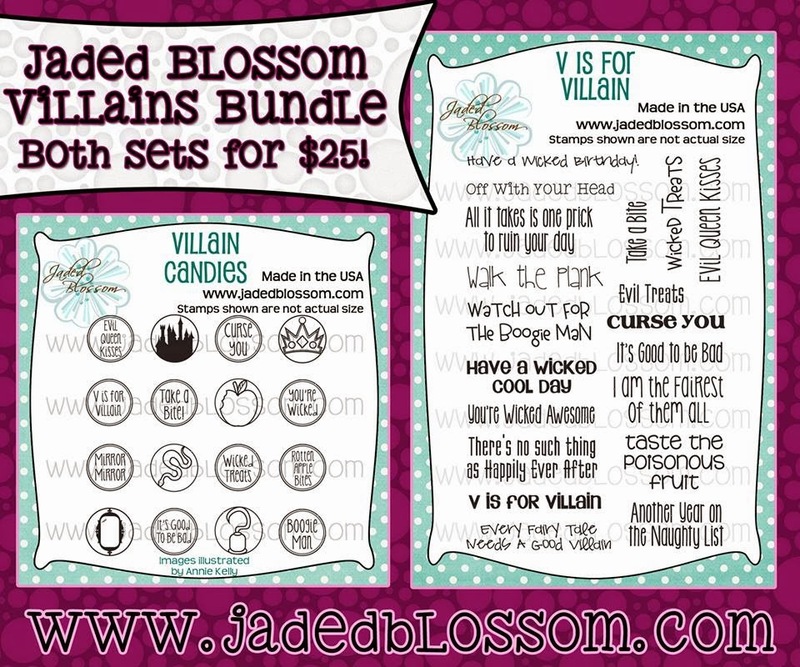 The most deliciously wicked villain ever... Great project. Wicked project ! She looks amazing ! Fabulous and the necklaces and jelly beans are perfect. Just saw the preview for the new movie tonight when we watched Frozen. Looks good! Great project. What a perfect sentiment! Love it!! Wow! Wow! Wow! you and Annie outdid yourselves on this one! Fabulous stamps and amazing cut files. I love how each file is so true to the character likeness. Amazing - and such clever sentiments as well. Maleficent is making me shake in my boots. You did an amazing job. This has been a fantastic hop with such great projects from a group of very talented people. Thank you all so much. So cute! love the sentiment!! Thank you for sharing. This is so cute! I have enjoyed this blog hop so much!!! As usual Candace your project is awesome! Love her horns! This has been the cutest hop ever - Thanks to everyone involved!! Love Maleficent! So wicked and cool! Love the sentiment also! Last is def not least! Great details! Thank you for such a fun hop!! fantastic job, this rocks!!! love her expression and the sentiment!!! you always do such an amazing job! thanks for a freakin' awesome hop! Love this one. Great hop...thanks for your share. Everyone did an amazing job! Thanks for sharing with the rest of us! Love it! Perfect treat box! Wonderful Maleficent! The colours really pop on this project. Thanks for sharing such a great project. Definitely snagged. Oh Candace, you and Annie really outdid yourselves with this fabulous hop!! Love your Maleficent, she is wicked good!! I am hoping sometime in the future you will do a Disney Heros/Princess hop!! she is fantastic!!! She looks exactly like the movie! love it, you ladies are incrediable.